We are the leading manufacturers and exporter of Moisture Balances and our product is made of good quality. Our balance is used in the industrial sector to analyze pastes, adhesive materials, and dust, mass & woods. This balance is manufactured utilizing supreme grade material and cutting edge technology in synchronization with set norms of quality by our professionals. In addition, offered balance is tested by a quality examiner on the predefined standards for dispatching a defect free range. 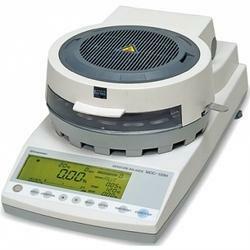 Looking for Moisture Balances ?